Two surreys because why not? 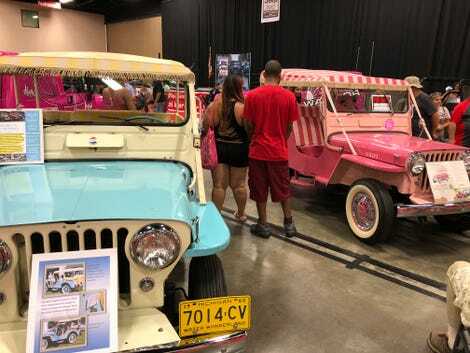 Toledo Jeep Fest was fun but exhausting, as most fun activities are. I literally hurt my left foot riding the clutch all morning: rarely have I longed for an automatic. Or 2 low. Anyway, I got to spend some time with beloved Jalopnik blogger David Tracy, met head of Jeep design Mark Allen, and exchanged on-air pleasantries with a local journalist while driving in a parade. What more could one ask for? Oh, yeah, and saw lots and lots of very interesting Jeeps, as my other posts have highlighted. And you can see me chatting briefly with the host of this one around 4:15.